Should you turn up the brightness? The other day I had a message from an academic colleague shame-faced at her elementary mistake in typing an email to a student. She should have typed the words “you need a small shift in thinking”. However, she mistyped and missed out a vital letter. I leave it to you to work out what she actually sent to the student. Part of the defence my colleague offered for her embarrassing mistype was that her computer monitor was broken and so she had a temporary small screen, making the characters harder to see, especially in a dimly lit room. It may be a coincidence, but this story is the third item in a week where lighting has been brought to my attention. The first was the publication of research from the University of Illinois which had been looking at the impact of teaching children in the open air, compared with a classroom. They found that teaching children outside had significant learning improvements when compared with teaching the same children indoors, using the same teachers and the same lessons. The only difference was being outside. The effect also lasted beyond that lesson. When the children returned to the classroom, they were better in the subsequent lesson as well. Being outdoors appeared to have a long-lasting impact on learning. That’s interesting if you are in education, I suppose. Many schools have what they term “outdoor classrooms” which are generally a series of tiered bench seats and a “sail” contraption above to protect the children from the elements. But what has it to do with us in business? After all, you can hardly complete your work outside in the open air, can you? Where would you plug in the projector for a meeting? And what about all that distracting noise outside, such as excited children in the school playground next door? It’s just not feasible for a proper business to do its work outside, is it? But then consider the third item I came across this week, which was another piece of research, this time from neuroscientists in Michigan who were looking at what happens to the brains of rats in varying lighting conditions. The researchers discovered that, rather like humans, rats have better cognitive performance when they are in bright light than when they are in dim light. For some time, it has been known that people can think better when they are in bright light. Shops, for instance, use this to their advantage. When they don’t want you to think, they will have dimly lit areas so that you are less prone to being able to work out whether you should buy an item or not. Instead, you become tempted by the offer, and you think less about it and, hey presto, sales go up. Shops do not use lighting just to make their products look good; they alter the ambient lighting to stop you being analytical. When the light is dim, you cannot think straight. The study on rats has helped scientists begin to understand why this happens. It turns out that in dim light, a part of the brain associated with spatial awareness and memory is altered. It seems that light levels have a direct effect on the structure of the brain. So, what do these three things that have happened this week tell us? My academic colleague might not have missed out a vital letter in the word “shift” if the room lighting were brighter. Similarly, the fact that children perform better having been in the open air could well be down to the fact that the additional light is changing their brain, improving their memory and awareness of the world around them. Fast forward to the average office or home. Lighting levels are relatively low; mood lighting they call it. Gone are those horrible bright fluorescent tubes. Instead, we now have desk lamps with low wattage LEDs or overhead lights that illuminate the “right areas” while leaving other areas somewhat dim. Here’s a fact from the science above: dim lighting means dim people. Interior designers will doubtless have all kinds of reasons why the levels of lighting make us feel nice, or keep us calm and happy. But in the world of work we need to think. We need to be analytical and we need to be more cognitively capable than the competition. Productivity in the Western World is pretty low – even recent gains are small and we are less productive as a nation now than we were 10 years ago. Could it be that our love affair with mood lighting and designer offices is making us less capable than before? 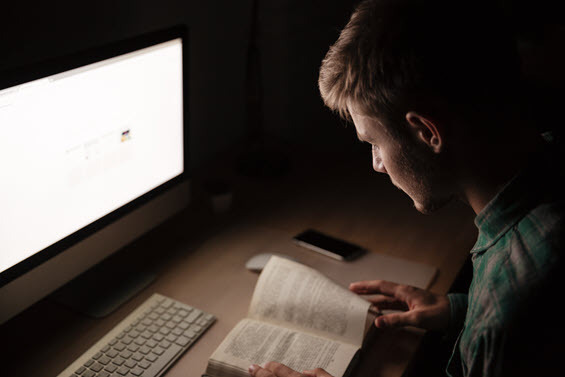 Perhaps it’s time to turn up the lights in your office, or failing that go outside and do some work in the park for an hour – just like the schoolchildren the benefit of that will last and boost your work performance. Are you selling quickly enough?